The Nazca Lines geoglyphs vary greatly in terms of size, form and complexity. Simple lines and geometric shapes run all across the arid plain, which stretches more than 50 miles across the desert near Peru’s southern coastline. You’ll also see representations of trees and flowers, etched into the dry plateau by the Nazca culture sometime between 500 BC and 500 AD. But by far the most intriguing geoglyphs are the zoomorphic designs: animals such as birds, fish, monkeys and humans. Incredibly, there are more than 70 of these zoomorphic designs in the Nazca desert, a handful of which comprise the most famous of all the Nazca geoglyphs. Peru is home to many hummingbirds, with around 125 recorded species. The Nazca hummingbird geoglyph is easy to identify because of its characteristically long and pointed beak and well-defined wings and tail. The geoglyph is about 320 feet long and 216 feet wide — a huge representation for such a tiny bird. This geoglyph is commonly known as the condor, but some argue that it represents a chaucato (long-tailed mockingbird). The latter lives in the local area, while Andean condors are common just 130 or so miles east, making either a possibility. At 440 feet long and almost as wide, the condor is one of the largest zoomorphic geoglyphs, making it easy to spot as you fly over the Nazca Lines. Some zoomorphic geoglyphs have an identity crisis, especially this one. Known variously as the pelican, alcatraz (an old Spanish word for pelican), phoenix, flamingo or cormorant, the only sure thing about this design is that it represents some kind of bird. Its stunted winged body leads to a lengthy zigzagging neck, which ends in a narrow head and beak. The pelican isn’t particularly wide, but at 935 feet in length, it’s certainly one of the longest of all the Nazca geoglyphs. 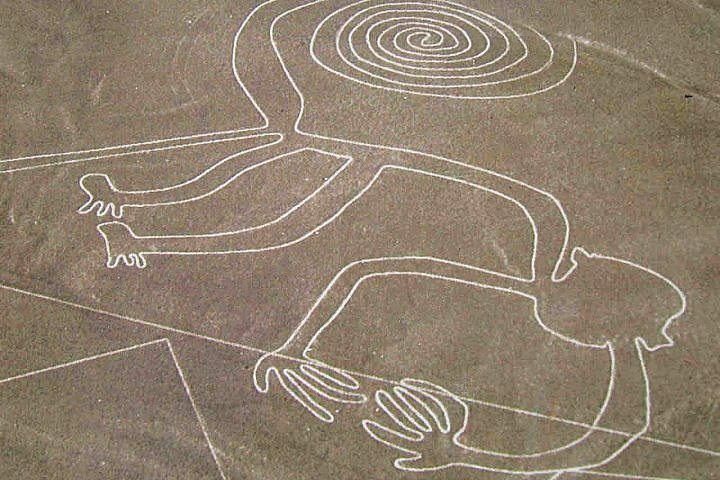 Always a crowd pleaser, the monkey is one of the most iconic — and fun — geoglyphs on the Nazca plain. It’s also notable due to its “foreign” nature. Monkeys typically come from the jungle regions of Peru and not the coast, so its very presence hints at trade routes developed or accepted by the Nazca civilization. The Nazca monkey is about 190 feet tall and 330 feet long. If you’ve ever seen Peru’s official national logo — the word “Peru” with an inwardly spiraling letter “P” — you can see how the monkey’s spiraling tail inspired the modern logotype. Arachnophobes beware: The 150-feet-long Nazca spider is big, well-defined and easy to spot from the air. The spider was one of the first geoglyphs seen by Paul Kosok, an American professor generally regarded as the first serious researcher of the Nazca Lines. Kosok began studying the lines in the 1930s. He was joined in the 1940s by the German mathematician and archaeologist Maria Reiche. Reiche, known as “The Lady of the Lines,” was the most famous of all the Nazca Lines researchers. She died in 1998; Nazca’s airport, as well as various schools and institutions, are named after her. It’s not so easy to spot the entirety of the Nazca parrot due to other lines running above or below it. But you should at least be able to make out the parrot’s head and beak, with a large crest or wattle protruding from one side. The lower half of the geoglyph has been all but erased by erosion and human construction, but you can still see the wings. Somewhat strangely, the outstretched wings are formed by parallel rectangular shapes, creating an unnatural representation of a bird. This design quirk helps fire the imaginations of the many “ancient astronaut” theorists who are drawn to the Nazca Lines. The Nazca dog has a startled or scared look about it, thanks to its perfectly straight and parallel legs, its open mouth, and upright ears and tail. Or maybe it’s just stretching. The dog geoglyph is about 170 feet long. Peru only has one native breed of dog these days: the Peruvian Hairless dog. The Nazca dog must represent one of the earlier breeds — perhaps an ancestor of the Peruvian Hairless — that existed in Peru at the time of the Nazca civilization. While the Nazca parrot provokes some outlandish alternate theories about the Nazca Lines, the Nazca “astronaut” leaves the world’s pseudoscientists and pseudohistorians absolutely convinced. Variously known as the astronaut, giant or owl-man, this geoglyph does bear a resemblance to a space-suited human. What exactly this human figure represents remains an enigma, but one fairly balanced argument states that it’s a fisherman. Researchers believe it to be a Paracas-era geoglyph, predating the later Nazca culture. Some argue that on closer inspection it’s possible to see the figure holding a net in his left hand and a dangling fish in the right. Given the coastal location and the importance of fish in the region, this seems a reasonable hypothesis. 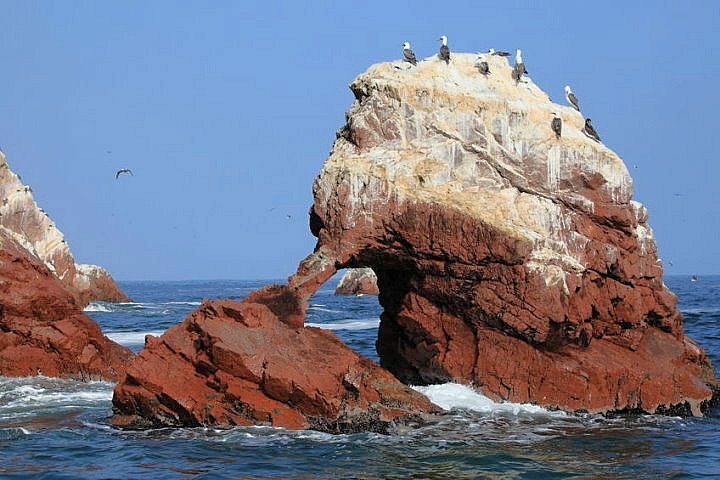 As a coastal culture, it’s no surprise that the Nazca people chose to honor the ocean’s largest and noblest of creatures. The whale geoglyph is simple in design, but is instantly recognizable from the air thanks to its well-defined flippers and flukes. There is in fact a second whale geoglyph, known as the killer whale, of a more intricate design but far harder to pick out from ground level or from the air. As with other zoomorphic geoglyphs mentioned here, whales are frequently represented in the beautiful ceramics of the Nazca civilization.